The scale of a new consultation on plans for a new Heathrow runway shows that the Government’s case for expansion is ‘unconvincing’ and further delay almost inevitable, campaigners have said. Transport secretary Chris Grayling has published a Revised draft Airports National Policy Statement (NPS), which is needed to take into account key information published since a consultation earlier this year, including updated demand forecasts and the Government’s latest national air quality plan. A new consultation will run until 19 December. Mr Grayling told MPs that the new forecasts ‘show that the need for additional runway capacity is even greater than originally thought’. He said: ‘Airport expansion is one of the most important type of infrastructure project for the UK – both in boosting our economy and jobs and promoting us on the world stage. 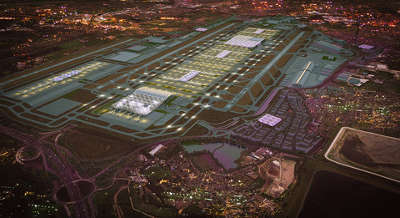 The Department for Transport (DfT) said an expanded Heathrow would be more accessible to the rest of the country thanks to HS2, Crossrail and at least six more domestic flight routes and that expected benefits include a £74bn benefit to passengers and the wider UK economy over 60 years and reduced fares, fewer delays and more daily destinations for passengers. However, this timetable has slipped. The Government had previously planned to bring forward the NPS in ‘winter 2017/18’. Not mentioned either by Mr Grayling or the DfT announcement was that the eight-week consultation came on the advice of Sir Jeremy Sullivan, who was appointed by ministers to provide independent oversight of the consultation process. Campaign group the Aviation Environment Federation (AEF) pointed out that new evidence covered a wide range of key impacts, including new forecasts of noise impacts, CO2 emissions, air pollution and the impacts of expansion on other UK airports, reinforcing ‘that the NPS as drafted is not fit for purpose’. AEF deputy director Cait Hewitt said: ‘The scale of this re-consultation highlights that the Airports Commission work cannot be relied upon and the Government’s case for Heathrow expansion is unconvincing.